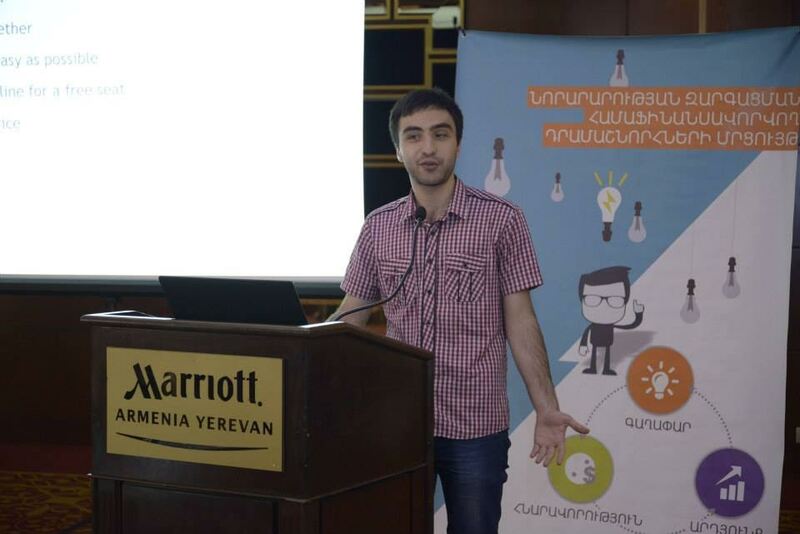 An interview alumnus Shahen Mailyan who is developing a new global restaurant app. His message to FLEX alumni: Our world is fast-paced and the key to be successful in it is to constantly develop new skills and deepen your knowledge. Do not be afraid of trying new things and, most importantly, never stop learning. 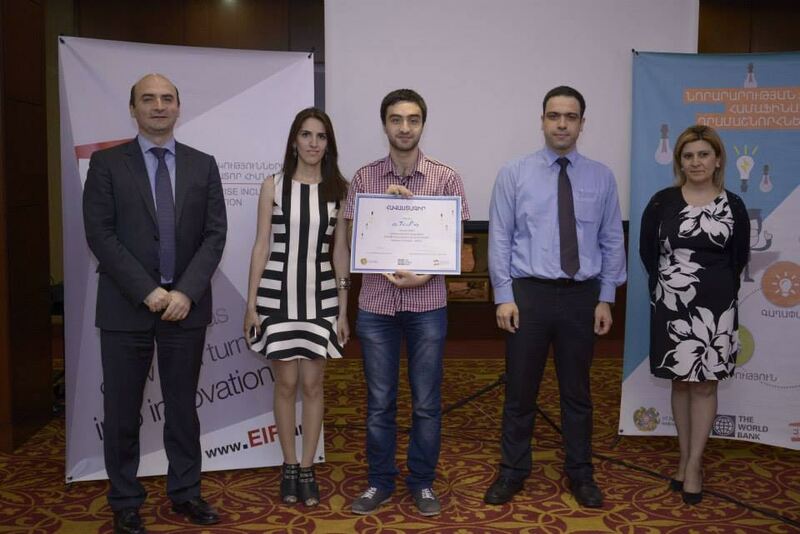 You have recently won the IT Startup of the Year in Armenia. Which project or idea brought this recognition? Over the last two years I have been leading the programming team in a company called Gavr Group, which specializes in creating and developing IT startups. As part of my work for the company I developed an app called Triip, which will help the user plan all aspects of his/her restaurant visit. Its main difference from other apps, such as Yelp, is that it’s social. This means that you will be able to coordinate your restaurant visit with your friends based on everyone’s current location in the city. Previously, if you wanted to go somewhere, you needed to chat to friends on Facebook, find a restaurant on Yelp and then make a booking on another website. Triip will cover all of the stages of your visit making planning quick and fun. The IT Startup of the Year, which is given by the Enterprise Incubator Foundation of Armenia, provided us with a matching grant, which has drastically accelerated our work. Thanks to the EIF we are now planning to release Triip as early as January-February 2017. Which cities will Triip cover? Since the Armenian restaurant market is still relatively small, we’ve decided to start with two international culinary centers, NYC and Los Angeles. Once the app is launched there, we’ll focus on Europe and then gradually expand to other regions. Who came up with the idea of this app? The idea of Triip belongs to Gavr Group’s team. The company saw a niche in the market and discussed the possibility of its technical realization with me. I immediately liked the idea and was invited to develop the application. You are currently in the fourth year of your BA degree. How do you manage to combine work and studies? Since both my work and studies are related to programming, one thing helps the other. I also recently received the Presidential Education Award in the IT Sphere and am very proud of it. I was not the only FLEX alumnus there. 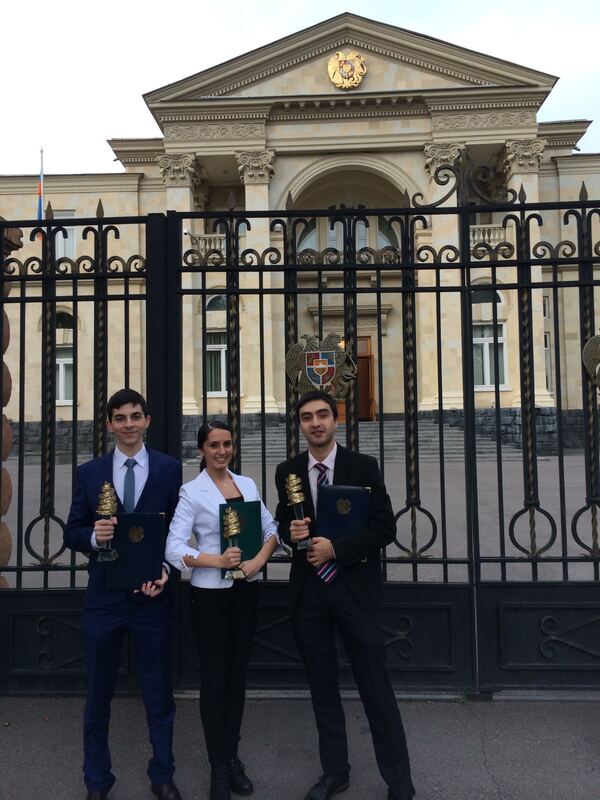 FLEX alumni Aram Serobyan ’12 and Lucy Manukyan ’14 were also among the winners. What made you choose IT among all other career fields? I was interested in IT and programming all my life, but decided to make it a career during my FLEX year. My American host Dad is a software developer and when I lived in the U.S. he introduced me to his friend, a famous software freedom activist who launched the GNU project, Richard Stallman. Seeing them discuss technology with such great enthusiasm made me convinced that I’d chosen the right career path. 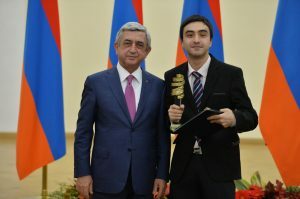 So I took IT classes in my American high school and when I came back to Armenia I started teaching a course on Gaming and Robotics at the TUMO Center for Creative Technologies in Yerevan. Did you enjoy this experience? It was great. When I started teaching at TUMO, I was only 16 years old and most of my students were older than. But since one of TUMO’s main goals is to inspire teenagers to learn independently, my English skills and international experience proved to be very useful. What do you like most about being a programmer? In my opinion, programming can be compared to creating art. Every time I finish writing a code, I feel a great sense of accomplishment. The process of programming itself is what attracts me most though – I can do it for hours without a break. Are you in touch with the FLEX alumni community? I try to take part in as many FLEX activities as I can. In 2013 I participated in the South Caucasus FLEX-Ability Conference where I conducted a workshop on Key Career Competencies. After the conference our team won a FLEX-Ability grant, which allowed us to organize a 3G ecological camp in three main cities – Yerevan, Gyumri and Vanadzor. A few of my closest friends are FLEX alumni, including the FLEX Alumni Coordinator of Armenia Suren Karapetyan ‘09. What are your aspirations? My primary aspiration at the moment is to make Triip a world famous app, which will be used by everyone. As for long-term projects, I dream to one day open my own IT Company through which, I will teach beginners about programming. Even though the IT sector plays an important role in Armenia’s economy, many young people don’t know where to start their learning process. The FLEX program gave me skills and inspiration to do it and I want to share it with others. Message to FLEX alumni: Our world is fast-paced and the key to be successful in it is to constantly develop new skills and deepen your knowledge. Do not be afraid of trying new things and, most importantly, never stop learning.